That was a rather frustrating day all round. 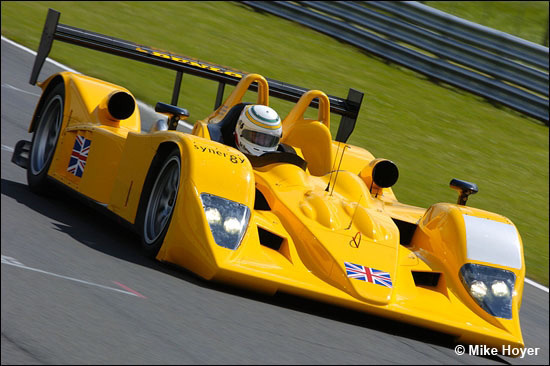 The #19 Chamberlain Synergy LMP1 Lola, plus the RML EX264 LMP2 version, were present at Snetterton yesterday, May 30 – and for various reasons, neither car completed many laps. The weather forecast was for blustery showers across Norfolk – and they duly arrived at 12.30. 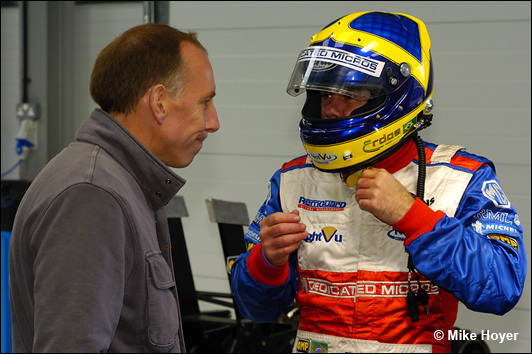 By then, Bob Berridge had completed a couple of short stints in the yellow B06/10. Hugh reckoned that this will be his 20th consecutive Le Mans 24 Hours as an entrant, with four other attendances, in other roles, before that. Apart from taking some excess tape off the radiators, and a slight wiring problem related to the marker lights on the Lola’s mirrors, that was the full extent of the ‘issues’ in the Chamberlain-Synergy car yesterday. 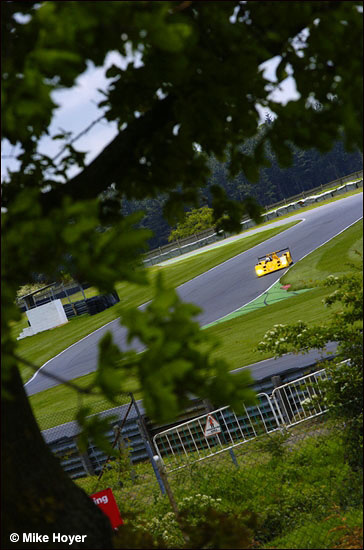 Mike Hoyer even managed to make Snetterton look wooded..
Bob Berridge revealed what else was on Tuesday’s agenda. There are a couple of aspects to the team’s plan in going very fast on the straights. Perhaps we’ll be able to touch on one of those either later this week, or at the weekend…. 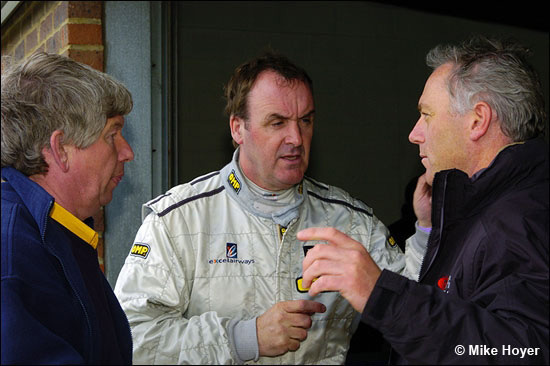 Engineers Paul Thomas and Dave Lampitt (above, with Bob Berridge, Lampitt on the left) must have had the ride height pretty much sorted before arrival at Snetterton, because the instruction between the two quick blasts round the track was to lower the ride height by 1 mm. Bob Berridge was happy to confirm that the low drag set-up was enabling him to go faster at the end of the back straight at Snetterton than he was on the Kemmel Straight at Spa, where the B06/10 was carrying considerably more downforce than in Norfolk yesterday. A look back at the speed trap figures from Le Mans last year reveals that the Pescarolos were in the 325 kph bracket before the braking point for the first Mulsanne Chicane. The French cars are undoubtedly going to be quicker than that this year (335 perhaps? 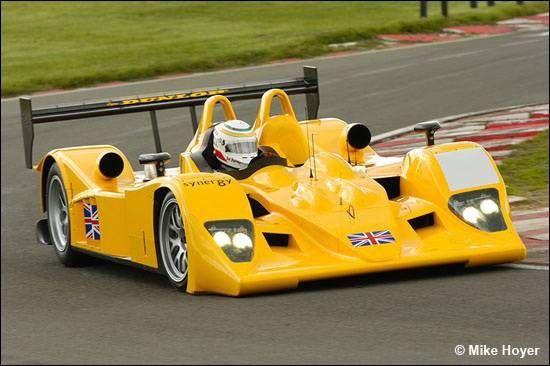 ), while a couple of the other LMP1s seem likely to be in the hunt for 350 +. The LMP1 Lola will be running at Le Mans exactly as seen here at Snetterton, so with no special bodywork for the long straights at Le Mans. The heavy rain that swept across the track wasn't to the liking of the mechanics, who weren't terribly keen on a full clean of the car afterwards, before the journey to Le Mans. That helipcopter? It belongs to Mike Lancaster at AER. He rushes all over the place overseeing his engines: the Gazelle has even been spotted in Martin Short’s garden! That's Lancaster, peering at his laptop, right, with Bob Berridge. RML was sorting out minor, post-rebuild puzzles yesterday, Tommy Erdos getting out after lunch, on a wet track. 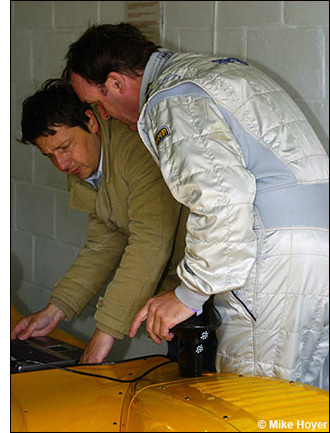 Then a gearbox software issue intervened, and neither Andy Wallace nor Mike Newton had a chance to venture out. That means that Andy Wallace won’t get to try the EX264 until the first day of qualifying at Le Mans, because he’s travelling to New York today, Wednesday, in readiness for Saturday’s Watkins Glen 6 Hours, and isn’t rushing back overnight for the Le Mans test day. 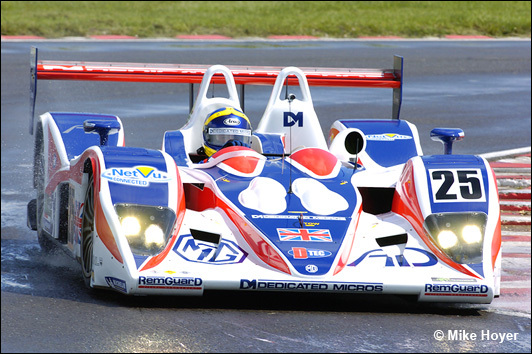 The RML MG Lola looked and sounded superb though when it did run – and what’s a shakedown for, if it’s not to sort out the gremlins? Unlike LMP1, the LMP2 race at Le Mans is likely to be less about absolute pace, more about consistency and reliability. RML won the class last year, but will be looking to do so in a different style this time. Test day preview to come: for the second time, the test day is less than two weeks before the start of the 24 Hours. We’re still puzzling out whether to expect test day fireworks or not! Last year’s test day was spoiled by the weather at the end of the day (when the fast times have historically been set), but this year we’ve got the Audi R10s at Le Mans for the first time.